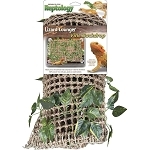 Penn Plax Reptology Natural Lizard Lounger Climbing & Resting Mats are woven mats made of seagrass that allow your lizard a place to climb or rest. These environmentally conscious mats offer a natural style and texture to your terrarium. Ideal for all climbing lizards and hermit crabs, the Natural Lizard Lounger Climbing & Resting Mats can also be used with Bearded Dragons or other ground-dwellers, if the mats are close enough to the bottom of your terrarium. The Natural Lizard Loungers are available in three sizes and styles, so you can create a multi-level jungle gym for your pet. Each Natural Lizard Lounger comes with a mat, suction cups, and leather ties. Suctions to glass, plastic, or acrylic habitats.